Ezekiel Chapter 33 Star Chart: Clockwise from when "I will lay the land most desolate, and the pomp of her strength shall cease; and the mountains of Israel shall be desolate, that none shall pass through" (33:28) in "the eleventh year of king Zedekiah ... in the fourth month, in the ninth day of the month ... (when) the city was broken up" (586 B.C.)(Jer. 52:5-7) till "the twelfth year of our captivity, in the tenth month, in the fifth day of the month, that one that had escaped out of Jerusalem came unto me, saying, The city is smitten" (33:21) is 536 days or one lap plus 176 days; or 18° months. 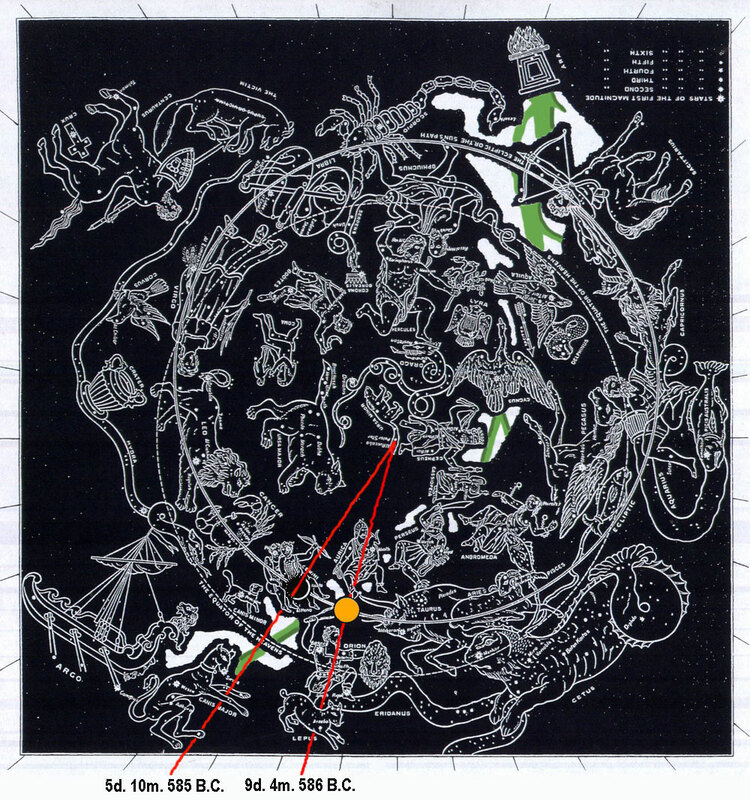 From the fall of Jerusalem till "I have set thee (Orion) a watchman unto the house of Israel; therefore thou shalt hear the word at my mouth, and warn them (Gemini) from me" (33:7) saying "Ye (lunar open mouth) eat with the (red radius line) blood, and lift up your (solar and lunar) eyes toward your (red radius obelisk) idols, and shed (red radius line) blood: and shall ye possess the land? Ye (Gemini, Canis Major, Lepus, Auriga) stand upon your (red radius) sword, ye work abomination, and ye (red radius) defile every one (Orion, Auriga and Pollux) his neighbour's (Castor) wife: and shall ye possess the land?" (33:25-26) is 18° months. 4 Then whosoever (lunar ear) heareth the sound of the trumpet, and taketh not warning; if the sword come, and take him away, his (red radius line) blood shall be upon his own head. 5 He (lunar ear) heard the (red radius line) sound of the (red radius solar bell end) trumpet, and took not warning; his (red radius) blood shall be upon him. But he that taketh warning shall deliver his soul. 6 But if the (Orion) watchman see the (red radius) sword come, and blow not the (red radius solar bell end) trumpet, and the (Gemini) people be not warned; if the (red radius) sword come, and take any person from among them, he is taken away in his iniquity; but his (red radius) blood will I require at the (Orion) watchman's hand. 7 So thou, O son of man, I have set thee (Orion) a watchman unto the house of Israel; therefore thou shalt (lunar ear) hear the word at my mouth, and warn them (Gemini) from me. 8 When I say unto the wicked, O wicked man, thou shalt surely die; if thou dost not speak to warn the wicked from his way, that wicked man shall die in his iniquity; but his (red radius) blood will I require at thine hand. 12 Therefore, thou son of man, say unto the (Gemini) children of thy people, The righteousness of the righteous shall not deliver him in the day of his transgression: as for the wickedness of the wicked, he shall not fall thereby in the day that he turneth from his wickedness; neither shall the righteous be able to live for his righteousness in the day that he sinneth. 15 If the wicked restore the pledge, give again (solar gold coin) that he had robbed, walk in the statutes of life, without committing iniquity; he shall surely live, he shall not die. 17 Yet the (Gemini) children of thy people say, The way of the Lord is not equal: but as for them, their way is not equal. 22 Now the hand of the Lord was upon me in the evening, afore he that was escaped came; and had opened my (lunar) mouth, until he came to me in the morning; and my (lunar) mouth was opened, and I was no more dumb. 25 Wherefore say unto them, Thus saith the Lord God; Ye (lunar open mouth) eat with the (red radius line) blood, and lift up your (solar and lunar) eyes toward your idols, and shed (red radius line) blood: and shall ye possess the land? 27 Say thou thus unto them, Thus saith the Lord God; As I live, surely they that are in the wastes shall fall by the (red radius) sword, and him that is in the open field will I give to the beasts to be devoured, and they that be in the forts and in the caves shall die of the pestilence. 28 For I will lay the land most desolate, and the pomp of her strength shall cease; and the mountains of Israel shall be desolate, that none shall pass through (586 B.C.). 30 Also, thou son of man, the (Gemini) children of thy people still are talking against thee by the (red radius line) walls and in the (lunar and solar) doors of the houses, and speak one to another, every one to his brother, saying, Come, I pray you, and hear what is the word that cometh forth from the Lord. 31 And they come unto thee (Orion) as the (Gemini) people cometh, and they sit before thee (Orion) as my (Gemini) people, and they (red radius) hear thy words, but they will not do them: for with their (lunar facemask smile) mouth they shew much love, but their (lunar) heart goeth after their covetousness. 32 And, lo, thou art unto them as a very lovely song of one that hath a pleasant voice, and can play well on an instrument (red radius trumpet): for they (lunar) hear thy words, but they do them not. 2 Son of man, prophesy against the (Gemini) shepherds of Israel, prophesy, and say unto them, Thus saith the Lord God unto the (Gemini) shepherds; Woe be to the (Gemini) shepherds of Israel that do feed themselves! should not the (Gemini) shepherds feed the flocks? 3 Ye eat the (lunar crescent) fat, and ye clothe you with the (white Milky Way) wool, ye kill them that are fed (Orion and Auriga): but ye feed not the flock.